While we thoroughly applaud HTC for trying to be innovative with this handset, in a smartphone world that sorely needs differentiation, it doesn't mean that we have to like what's on show. In the same way that we don't need our phones to be able to also churn butter, the non-mechanical volume buttons are a pointless change. That said, this is a powerful phone with amazing audio and a half-decent camera... it's just not the best to use. Who might buy the HTC U12 Plus? Either those who are upgrading from the decent HTC 10, or someone looking for a decent alternative to the iPhone / Samsung duopoly at the top of the smartphone tree. That person would want something cool and alternative, a phone that promises to let them do something their friends couldn't do, and do so at a reasonable price. The thing is, while the HTC does offer that, it's not a good thing. It's definitely cheaper: you can buy this phone for £699 / $799 / AU$1,199 off contract and SIM free, which is far less than the Samsung Galaxy S9 Plus and iPhone X it's going up against. There's a lot of power here as well: the basic model of the U12 Plus comes with 6GB of RAM combined with the latest cutting-edge Snapdragon 845 CPU, as well as (at least) 64GB of onboard storage. On top of that HTC's created a 'cold-polished' glass production process, meaning curved edges with thinner bezels on the screen, and two tone colors on the back... all in all, a very attractive phone indeed. We've not even mentioned the excellent audio quality, both from the speaker and through the bundled high-end USonic headphones - there's a lot here that HTC fans would be cooing over, and other people that just like a quality smartphone too. The camera is finally dual-sensor on both the rear AND front of the phone, and it's been awarded a stunning DxOMark, the testing program that rates the quality of the pictures. 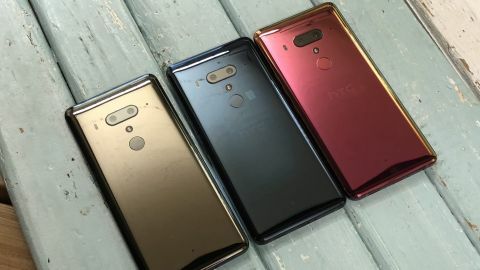 The HTC U12 Plus isn’t horrendously expensive, the £699 / $799 / $1,199 starting price a little lower than a few other flagships on the market, including the iPhone X and Samsung Galaxy S9, which should help to make it a fairly attractive proposition. In terms of a release date, the HTC U12 Plus was launched on May 23 onto the world, but it won't be until June that you'll be able to get your hands on it. Europe will be set for the middle of the month, according to HTC, with the US likely to follow suit soon after. Verizon will be stocking the HTC U12 Plus in the US, with various other networks likely to do the same in the UK. It'll also be available for sale on HTC.com and through Amazon. The design of the HTC U12 Plus is rather different to the HTC One M8 (or even the HTC 10) might have experienced. Where they would be used to a phone that's hewn out of aluminum, something that feels incredibly premium in the hand, the new phone is made out of mostly glass. While that sounds fragile (and we did cause a small crack at the top of the phone from dropping it onto a hard floor) it's actually a pretty premium material to use in handset construction and allows for more signal to get into the device. You also get a clear plastic case in the box, which provides more than ample protection for the handset. When you're talking about a phone that can manage to download 1.2Gbps at its peak, it's important to use a material that lets that through. What it doesn't explain is why the HTC U12 Plus is shorn of any wireless charging - surely that would be an obvious thing to pop into the handset this year? Sadly, it's not there, even though nearly every other brand has added it into its flagship devices. The U12 Plus, despite there not being a smaller model to go alongside, is a large unit and falls squarely into 'phablet' category. It's certainly a plus in terms of size, although it's only 8.7mm thin. As such, you'll struggle to get your whole hand across it, thanks to the screen encompassing most of the front of the phone. That's something a lot of people will be used to now, but if you're moving from the HTC 10 or the Samsung Galaxy S6, for instance, it'll take a bit of getting used to. The main flaw in the design - and we very much mean it when we say flaw - is the immobile buttons on the side. There are no buttons anywhere on this phone, and it's designed to make it almost impervious to water and dust. The idea is solid: fewer moving parts means fewer things that can go wrong. But the first time you try the non-moving volume buttons, which react to pressure from your digits despite not moving. It feels like you’re doing something wrong. It's so difficult to change the volume on this phone. You have to keep shoving your finger into the 'button' and hoping it works, with no physical feedback to work out if you've succeeded until it buzzes. You can't even change the sensitivity of this element... it's really weird when the buttons previously were just fine the way they were. We constantly keep turning the phone on by stroking the sensitive power key when picking up the handset, and it's really irritating. We even had a situation where if you put it in a slightly tight jeans pocket, it would turn down the volume down on what you’re listening to randomly. If you pick up an alternative phone, actually being able to press a button in on the side feels like coming home to normality. You might eventually get used to the sensation, but it’s a stupid move from HTC that’s instantly going to put people off when they try it. The screen on the HTC U12 Plus is the best we’ve seen on a phone from the brand, taking into account all the features that its competitors are thrusting into their wares these days. It’s a 6-inch, 18:9 1440x2880 resolution affair, but lacks the notch at the top that many top phone of the moment are packing. Instead there’s a large-ish bar at the top and bottom, which would be sacrilege for some brands looking to create the ‘all-screen’ look that adorn many phones. However, it’s hard to say this is a negative thing given those bars pack in the improved Boomsound speakers that offer exceptional audio from the phone, and while it does make the phone rather long and slightly weightier, it’s a trade-off worth trying. The quality of the screen, which uses the Super LCD display technology that largely only HTC puts in its phones, is fine without being amazing. It’s a long way from the best on the market - that title is always nabbed by Samsung OLED technology (or perhaps Sony’s decent LCD offerings) because of the rich color reproduction and contrast ratios. HTC’s done a fairly decent job here - HDR 10 quality is supported for YouTube, but not Netflix or Amazon Prime just yet (which seems like a slightly dumb move when there’s loads of great content for mobile on there). Still, at least it’s packing plenty of brightness and YouTube HDR looks decent. Generally watching movies on this phone is fine too. Coupled with the Boomsound speakers it’s a great phone to hold, and the sharpness and colors, along with the brighter screen, are fine… another time when it’s hard to use a better word, despite that one being so bland. Looking at the screen off-angle shows it gets a little darker than the competition, and doesn’t wow in the same way. The color reproduction on the screen can be altered a little, making things a little more colorful if you want more of a cinematic experience. However, both this and the default version look a little artificial - again, it’s just fine. There’s nothing terribly wrong with the screen quality on the HTC U12 Plus, but without full HDR support, great off-angle brightness or impressive color reproduction, it’s hard to really laud the efforts here on a high-end smartphone.